I was skeptical about the Cinnamon Squares this week. I love coffee cake and I enjoy chocolate, but I had never considered putting the two together. I've never been a fan of pain au chocolat and prefer my chocolate treats after dinner. However, I've been convinced this week that cinnamon, coffee and chocolate play well together. To prove the point, I made some of my squares without chocolate and some with. The chocolate ones were perfect and the plain version was missing this extra flavor boost. I made some unintentional modifications when making this cake. I forgot to put the cinnamon/sugar/espresso powder in the middle so I sprinkled it on top. I think it would have been much tastier blended into the cake. I also lost track of time and didn't make the frosting. You can find the recipe for Cinnamon Squares in the book Baking: From My Home to Yours by Dorie Greenspan or here. To see how the rest of the TWD group fared with this week's recipe, click here and then click on each blogger! Thanks to Tracey of Tracey’s Culinary Adventures who chose the recipe for this week. A delicious coffee cake with a chocolate kick. Jessica of My Baking Heart picked Parisian Apple Tartlet on page 319. That's a handsome cinnamon stick! :) Your cake looks moist and yummy. I'm sure in the end it was still pretty good! And I can't believe you're back into your old habits of testing more than one way... geez, the courage and stamina you have, woman! Your bars look lovely. I love the spin you always seem to give on the recipes...makes it exciting each week to come and see what you've done, imagined, created...always fun. Thanks for visiting my blog and leaving comments. I appreciate it! These cinnamon bars look amazing. I don't know if I dare to make them yet but kudos to you! Well not as bad as forgetting the butter ! Wonderful shots and I'm sure it tasted so good anyway !! MMMMM...this looks so tasty & appetizing! Great dessert! It still looks really great! I love the cinnamon sticks! 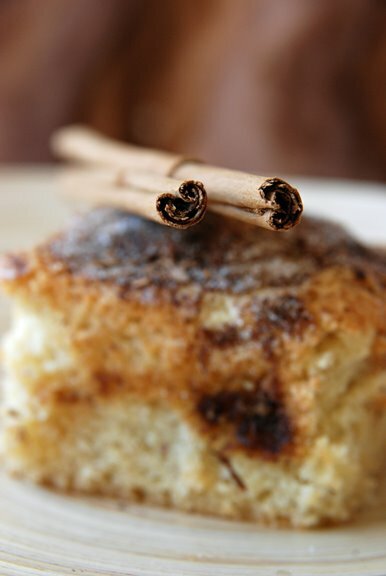 There's something particularly gratifying in that wonderful cinnamon stick your cinnamon look so :Delicous! Your cake looks tender and perfect. Somehow I missed the espresso part when reading other posts on this. That combination of cinnamon, espresso, and chocolate sounds great. Wow, your pictures are beautiful - love the cinnamon sticks! I'm so glad that you enjoyed these Shari! I'm still partial to the non-chocolate version, but I think this recipe is definitely a keeper! 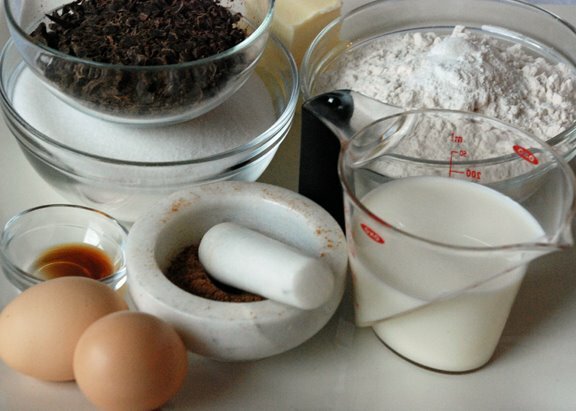 Coffee cake is one of my favorite things in the world... yours looks beyond delicious! And photographed beautifully too! Your cake looks great with the filling sprinkled on top (unintentional or not). I'm glad you ended up liking it. That first pic with the focus on the cinnamon sticks is so lovely. This was easy to put together. Yours looks tasty. Oooh, what an interesting twist, with the goodies on top. It sure looks yummy anyway. Your unintentional mods to your Cinnamon Square cake turned out beautifully! It looks mighty tasty and your photos are beautiful! cinnamon and chocolate are a great combination! 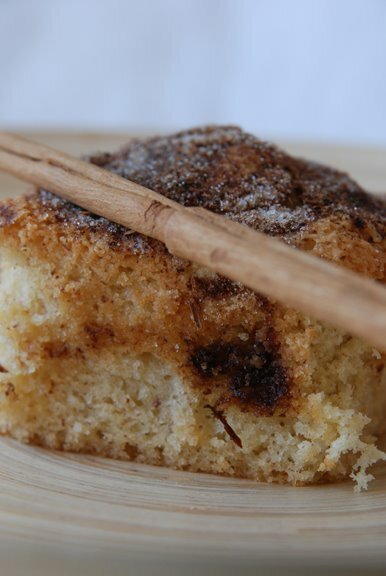 i love the photos with the cinnamon stick! Your cake looks lovely, and as always, you photos are stunning. I love it when the recipe ends up winning me over! And how great is it that we now have a coffee cake to make that has chocolate in it? Gotta love those unintentional modifications. =) It still looks great. Shari, how do you make such wonderful and beautiful food week after week?! You amaze me. This is stunning.